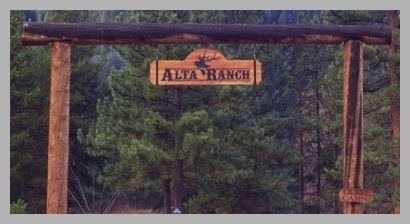 The Alta Ranch is four hours south of Glacier National Park and six hours from Yellowstone. By car, the ranch is two hours south of Missoula International Airport, five hours from Spokane, nine hours from Seattle, and nine hours from Salt Lake City. From Missoula International Airport, take Highway 93 south to Darby. About 3 miles south of Darby, turn right on 473/ West Fork Road. The ranch is about 2 miles past Painted Rocks Reservoir one half mile past mile marker 27. Turn right into the ranch at 9203 West Fork Road and turn left to manager's lodge and office. Welcome!